Organised by Academy of Food and Wine Service (AFWS) and The Caterer, the competition is open to professional sommeliers and waiting staff working in the UK. 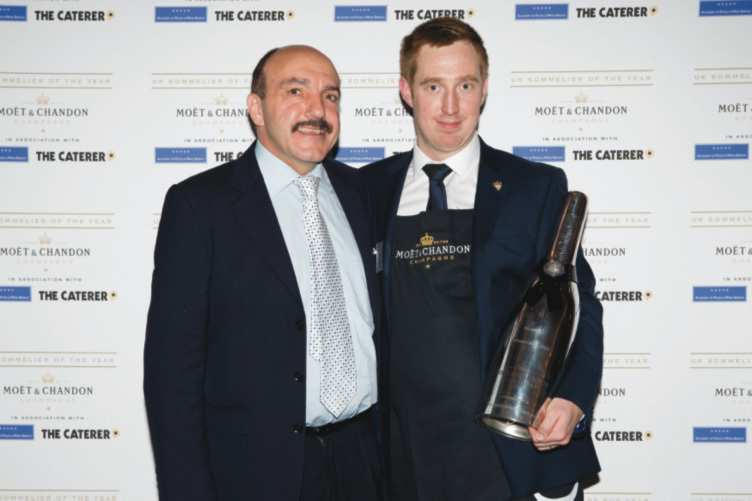 Now it its 37th year, the Moët UK Sommelier of the Year is widely regarded as the premier accolade in UK wine service. Past winners number some of the industry’s leading lights when it comes to wine knowledge, including Gerard Basset, Ronan Sayburn and Xavier Rousset. Candidates will be judged on their wine and drink expertise as well as their ability to deal efficiently and knowledgeably with customers by demonstrating exemplary front of house skills. Entries are paper based before heats take place in Edinburgh, Manchester, Bristol and London. Two sommeliers from each heat will progress to the finals day which is held in front of a live audience at the Mandarin Oriental Hyde Park on 16 May. All national finalists will win a trip to Maison Moët & Chandon in Epernay for an in-depth tour and technical tasting with the Moët & Chandon winemaking team. The competition’s chief judge is Gerard Basset, OBE, MW, MS, and 2010 World Champion Sommelier. The Moët UK Sommelier of the Year 2016 is sponsored by AdVini, BaxterStorey, Hildon, Matthew Clark and Winterhalter.